Oh my gosh! It’s seed inventory time! The last two days, I’ve been going through my garden seeds. Now to most people, this isn’t much of a problem…maybe a jar or small box full of seed packages from last year. But for me, a confirmed seed-aholic, it’s actually WORK. You see, I have over two large sized plastic storage totes plumb full of smaller boxes of seeds in packages, bags, pill containers and jars. And there are several years’ worth here, too. 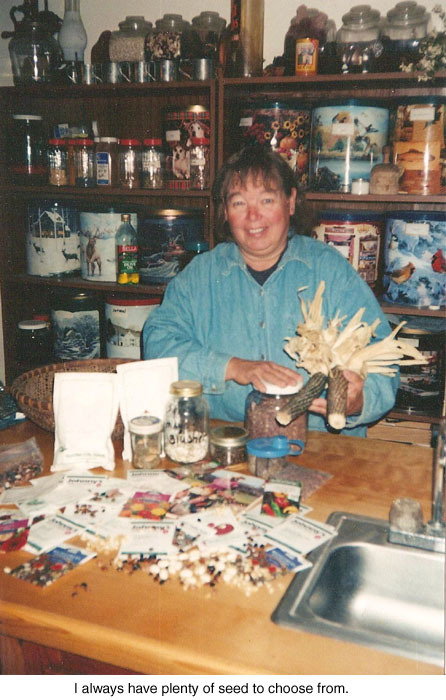 Many are old, old time traditional seeds, given to me by folks here and there all across the country who know about my love of seeds. For instance, I have a bag of perhaps half a pound of large white runner bean seeds from a man in Capulin, New Mexico who found a small pottery container of these seeds in an ancient Indian ruin on his ranch. He gave some of the seeds to the University, where they were carbon dated back 1,500 years!!! And, more amazing, he also planted some of them and they grew. And he’s been growing them for many years now. My bag of seeds came from those ancestors! Now isn’t that cool??? Well, today I found them. Two half pound bags, full! They were in the Pea Box!!! Tomorrow I’ll have it done. Whew! Imagine! I’ll know exactly what I have in those blue tubs! I’ve been writing down all the varities in a yellow legal tablet. Pages and pages worth. And I’ve also been making notes in seed catalogs of varieties I need to increase. I didn’t even notice that it started snowing. Wow this is so great! Being able to ask you a question right here from the Backwoods Home website! Here goes… I’ve been looking at pressure canning, not ready to do any canning yet, no garden yet. My question is, what difference is there, if any, between a PRESSURE COOKER and a PRESSURE CANNER? Can you “bleed out” an animal by slitting it’s throat just as effectively after it has been shot, or does it have to be alive when you do it? My husband and I are in disagreement on this issue. I think it is cruel to kill an animal by slitting it’s throat and letting it bleed to death. He believes that in order for the heart to pump out all the blood, it has to be done this way? Does it? You’re both right in my opinion. I couldn’t cut a live animal’s throat, although many people do just that, in order to get more thorough bleeding out. Generally, most people first shoot the animal, then quickly cut the throat. If this is done quickly, the animal will bleed out enough before it is dead, dead. My mom was wanting to know if you have any good canned pickled egg recipies. All she can find are refrigerated pickled eggs. Here’s a recipe for your mom: Sterilize quart jars…you’ll need about one jar per dozen medium eggs. Pack hard boiled, peeled eggs into jar to within an inch of the top. Add 1 sprig dill, 1 chopped garlic clove,and 1 crushed, dried red pepper if you want spicy eggs. For every jar of eggs, pour 3 c. white vinegar and 3 Tbsp sugar into a pan and bring to a boil. Simmer 5 minutes. Pour over eggs in jar, to within 1/2″ of the top. Process in a water bath canner for 20 minutes. Love your columns!! Do you have any experience with making cat food? Have an active kitten, and he almost died from “tainted” top-quality cat food; I want to avoid that in the future. Would appreciate any help. I would really not want to make cat food; getting the proper nutrition is harder than you might think. The tainted pet food makes me really, really nervous, as it is only the possible tip of the iceberg. For instance, how easy would it be for tainted gluten or other products to get into human food????? Unfortunately, we don’t have a lot of choice here; questionable nutrition or possible tainted food. But as the focus has been strong on pet food safety, I’d gamble on it….at least for awhile. You can certainly give your kitten some home cooked food, such as chicken, giblets, liver, beef and fish for a portion of its diet. Jackie, please can you elaborate on this? (Jan. 3 post regarding canning). I’m having a problem with pressure canning broth. I let the canner cool until there is no pressure on the gauge, as instructed, but my problem is that after I remove the canner lid the jars will go from still to explosively boiling, such that hot broth spills out under the lids. Tonight I’m canning up some beef broth, and, figuring that the loss of liquid was secondary to either too much broth or too fast depressurizing, I tried to go slower with taking off the lid and removing the jars from the canner. I still had problems with loss of liquid though, and I was inclined to leave the jars in the canner until the morning until I read this entry of yours. Now I’m not sure what to do! My second batch is done, and I hear the “ping” sounds of lids sealing, even though I haven’t opened the canner lid. I’m up late baking bread, so I think I’ll wait as long as possible before opening the canner. At least what you’re warning against is loss of seal–I can check for that and just place any unsealed jars in the fridge. My second question is regarding fat in the broth. All of my references instruct to discard the fat, but I can’t help but think this is coming from the fat-phobia of the past 20 years or so. This is broth from good pasture-finished organic beef–I’m inclined to save the fat! I read somewhere that a layer of fat on top of broth helps it keep longer, but I suppose that’s not as relevant for canned broth. What is your opinion on fat in canning broth (or meat)? Broth sometimes does this because it is pretty much totally liquid. To stop it, first be sure not to fill the jars too full. Then, when the time is up, watch your canner that it doesn’t go BELOW zero. They sometimes do that when cooling and it will cause furious boiling when you take the jars out. No, don’t save the fat! The reason you don’t leave fat on foods is that while the jar exhaust, some fat can blow out of the jar and onto the rim, preventing a seal. It’s not a fat-phobia but a real problem. I don’t remove ALL the fat on my broth; it gives flavor. BUT scoop off a lot of it because the more you leave, the better chance that one or more jars won’t seal.